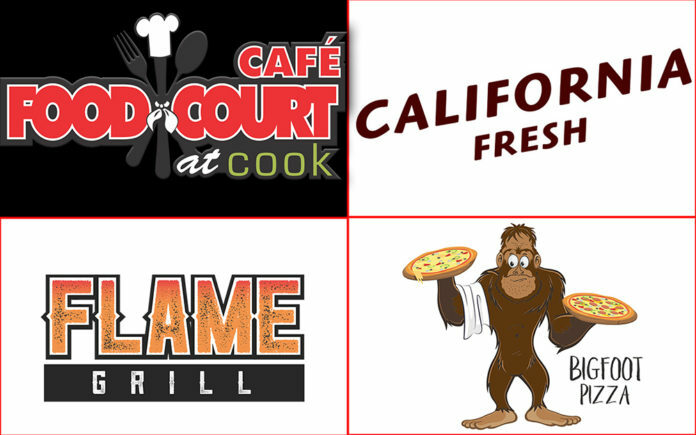 With three different themed outlets, there’s something for everyone at the Food Court at Cook. You might have driven by the Food Court at Cook and wondered what it was all about. Well, at least that’s what I thought. I was intrigued by the 2nd Best Pizza banner on the building, and thought why not be the Best Pizza? It turns out that my question would be answered as I came across a local TV show that was featuring Jack Jennings, the owner of the Food Court at Cook. He explained how he didn’t want to put say that the pizza was number one, as to not appear arrogant. It makes perfect sense, and was a good marketing tool, as got me interested and through the door. The food court has three different food style options to choose from. There’s Bigfoot Pizza, Flame Grill and California Fresh. Bigfoot Pizza’s (2nd Best) are made with imported Brooklyn dough, and come in a vast variety of creations, including the Yeti (extra virgin olive oil, mozzarella, artichoke hearts, grape tomatoes, red onions, cremini mushrooms, roasted red peppers and fresh basil), the Northwest (pink sauce, mozzarella, sharp cheddar, bacon, honey smoked ham and fresh basil) and the Sasquatch (red sauce, mozzarella, pepperoni, Italian sausage, bacon, honey smoked ham and lean ground beef) plus many others, including build your own. The nice thing about their pizzas is that they are not expensive at all, only $9.99. 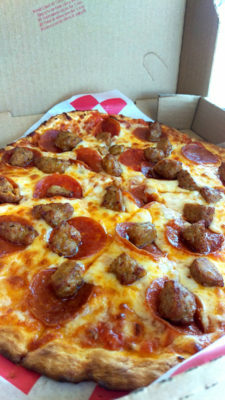 They also have a 10 inch 2 topping pizza special for only $5.90. This is the deal that I went for, and it was a pretty good sized pizza for the price. 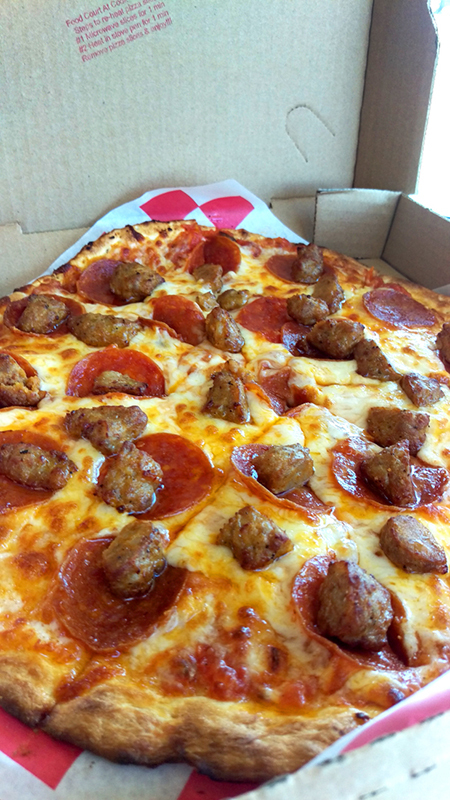 The Brooklyn crust was crisp, and my pepperoni and sausage toppings were well supported by the cheese and sauce. One heck of deal! Flame Grill has breakfast items (breakfast burrito, breakfast platter, pancakes, French toast, breakfast bowl and a breakfast sandwich), burgers, hot dogs and bowls (chicken, veggie, and beef). If you’re looking for a sandwich, salad or a wrap, even pasta, then California Fresh is where you’ll want to order from. There you will find Tuscan Chicken Pasta (roasted garlic, sun dried tomatoes, marinated chicken breast, with whole wheat penne pasta and fresh basil), Cobb Salad (romaine lettuce, egg, bacon, tomato, green onions, avocado, chicken and a choice of cheese), Heavenly Turkey Sandwich (slow roasted turkey breast, lettuce, tomato, Havarti and cranberry mayo, on a choice of bread), as well as other selections. The Food Court at Cook offers free WiFi, and also has a drive through which is especially convenient in the summer. Uber Eats is available for delivery service. The Food Court at Cook is a great spot for a quick convenient meal, and really does have something for everyone.